Biryani is my most favourite food. It must be a robust mutton biryani typically available in Mumbai of course, but I'd settle for the more subtle Avadhi or Kolkata style biryani in a pinch. Among my fondest childhood memories is the biryani that was ordered for one of my birthdays from Jeff Caterers in Bandra. The fragrant spicy biryani with golden flavourful chunks of potatoes- my mouth waters even today! As I grew up I tasted different biryanis across Bombay (in those days it was Bombay) and biryani reigned as my top favourite food if we were eating out. The choice of cuisines available in those days was mainly Chinese or Mughlai and biryani won hands down over Chinese Chopsuey, my Bong genes notwithstanding. The apartment block I grew up in, at Bandstand , Bandra, had a wonderful mix of Muslim families. There were Bohris, Khojas and Sunnis.. oooh the variety of delicious food! Every Eid was a smorgasbord of wonderful food. Sheer Khorma, daal gosht, saalans, kebabs, and of course biryani! My brother would hound the neighbouring aunty in the days running up to any Eid, begging her to make biryani and we just took it for granted that we would be part of the celebrations. Not only did we go over and stuff ourselves shamelessly, other families also sent special preparations cooked up in their kitchens. Life was wonderful. My mother did a short cooking course at the Dadar Catering college and among the many things she learned there, one was biryani. Oh the way the entire house would bask in the aromas from the kitchen! And the brother and I would be hopping in anticipation, waiting for biryani to be done so we could dig right in. Yes, we're the same even today - just can't wait to dig in. A few weeks ago plans were made, tickets were bought and mom and bro were set to arrive for a visit. The only thing the brother kept saying was cook something nice, cook something nice. So I thought of making biryani. We all love it and the hubby is quite fond of it too. Mutton biryani was on the menu. 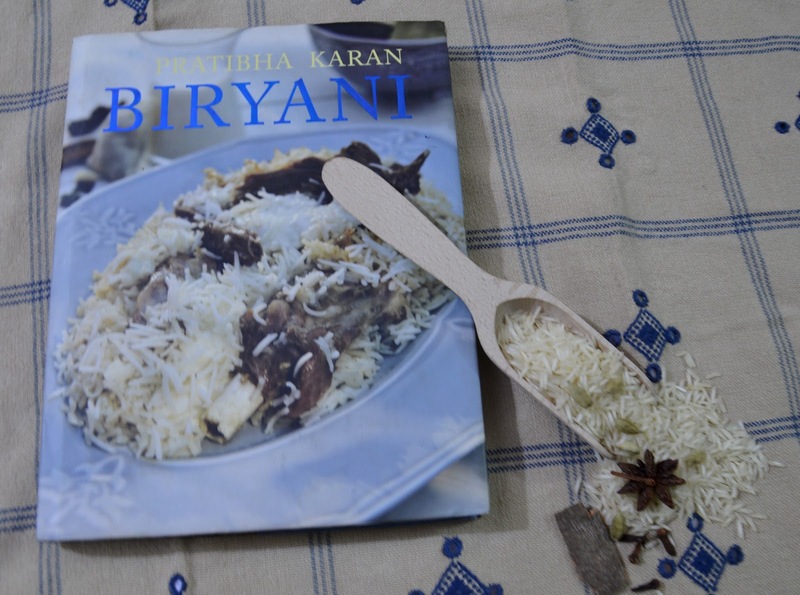 I'd made biryani just once before and I was quite surprised at how simple it really is. And that is mainly why I was confident and relaxed enough to make it again, and that too for this audience. I was competing with all those amazing biryanis of our childhood, after all! 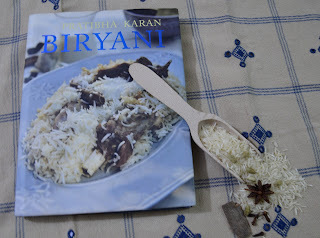 I pulled out Pratibha Karan's book Biryani and used her recipe for Katchi Biryani from Hyderabad. In this recipe the raw meat is cooked under semi cooked rice, in a tightly sealed vessel. I used her recipe as a basic guide and then more or less did my own thing. So here's my version of kachche gosht ki biryani. 1kg goat meat, preferably kid. cubed. 4 inch stick of cassia bark or Dalchini. I prefer Cassia over cinnamon in this recipe. The only painful part in this recipe is frying the onions. Heat a generous quantity of oil in a kadai or wok and fry the 4 sliced onions till they are golden brown. reserve 1 sliced onion for later. Take care not to burn them (I did, the first time I made this biryani). Drain out the excess oil and let the fried onions cool. Add a scant teaspoon of sugar while frying the onions - not only will they brown faster but you will also get a fabulous depth of flavour. Once the onions are cooled, crush them as well as you can. Keep some fried onions aside for the final garnish. Marinate the mutton. I don't wash the mutton much. Just a very very quick rinse and that's it. Let it drain and then add the crushed onions, dahi, garam masala powder, ginger garlic paste, chopped green chillies, mint, coriander and salt. Add the lime juice too. Mix it all thoroughly and let it marinate for at least 7 to 8 hours. About 2 hours before you want to serve wash and drain the rice and then lay it out on a tea towel to dry. This simple step helps in keeping the rice grains separate while cooking. 15 minutes on the tea towel should suffice. In your biryani degh or thick bottomed vessel heat a couple of tablespoons of oil. Use the oil left over from the first batch of fried onions. Once hot, add the whole spices and the reserved sliced onion. Brown the onion lightly and then start adding the marinated mutton. Braise it slowly on a medium flame stirring all the time. Once all the meat has been added let it braise for about 15 to 20 minutes. Stir every few minutes so all the pieces get seared and nothing sticks to the base. Add the all marinade to the pot. Once most of the liquid has evaporated it's time to add the rice. In my house biryani without potatoes is considered a crime against humanity. So potatoes were duly added. Usually regular large potatoes are quartered or cut into 6 chunks at the most, depending on how large they are. I had bought a bag of baby potatoes hoping that Mom would make Alu'r Dom but instead used them in the biryani. Scrub the potatoes really well, fry them in a little oil and add them when the meat is half braised. Poke the potatoes with a sharp knife to ensure cooking and to help them absorb the wonderful flavours of the biryani. The original recipe requires the rice to be cooked a little before it is added to the meat. Boil about 3 1/2 litres of water with salt and a tsp of oil. Add the rice into the boiling water and cook for 3 minutes. Don't overcook! Drain the rice in a colander. Good quality Basmati cooks very fast so I took a chance and skipped the above step and added my washed, drained and dried rice to the biryani. All you have to do is spread the rice on top of the meat in the degh. There will be just two layers - meat at the bottom and the rice on top. Poke a few holes through the rice and pour in pure ghee. You can also sprinkle saffron milk over the top to give the rice grains a pretty colour. Add a cup and a half of hot water and then cover the vessel with a tight fitting lid. You can weigh the lid down with a heavy stone or you can seal it with a simple dough. Once the vessel is sealed let the biryani cook for 30-35 mins on a slow flame. A good indicator for doneness is that the dough sealing the degh will be dry and hard. Open up the degh and garnish the biryani with a handful of chopped fresh coriander and a generous sprinkling of fried onions. If you're like me, you will take a photograph at this phase! Stir up the biryani to mix the meat, potatoes and rice and serve with a simple raita. I'm glad to report that the biryani was quite a success. I had misjudged the proportions a little and there was more mutton than rice but nobody was complaining ;) And those baby potatoes were simply delicious! The family gathered around a degh of biryani.. there are few things that could make me happier. 'twas truly a happy dinner BIL, MIL and us ... the Biryani was so good there was a studied silence over dinner. This is truly killer recipe. ANd that looks like a fabulous result. I love biryanis. Will try it very soon. Thanks for sharing. Very touching article... Recipe sounds good too,Rhea so you would add more rice for your next Biryani ? Rhea, you are so good explaining the cooking methods that anyone tries you recipe would come out as a winner. You are a natural story teller and have fun with your blog. Oh the story telling and the final biryani! Beautifully done, Rhea! I'm always hungry for biryani, this one is fabulous and it looks great!